SLO Bacon Fest draws a huge crowd! DECADENT: This little nugget of tastiness comes from Lickety Split cupcakes in Grover Beach, and yes, it’s as delicious as it looks! Even though my doctor told me to lay off the bacon, sometimes you’ve got to take one for the team, so here I am walking into the SLO Bacon Fest on Saturday, Nov. 23. It’s straight up noon, and there’s already a line winding through the Alex Madonna Expo Center parking lot. I can smell the bacon from outside the building. Wristband festooned, I’m handed a paper plate and a plastic cup and I wade into row after row and table after table of bacon dishes, desserts, and—in the case of Bakon Vodka—drink. 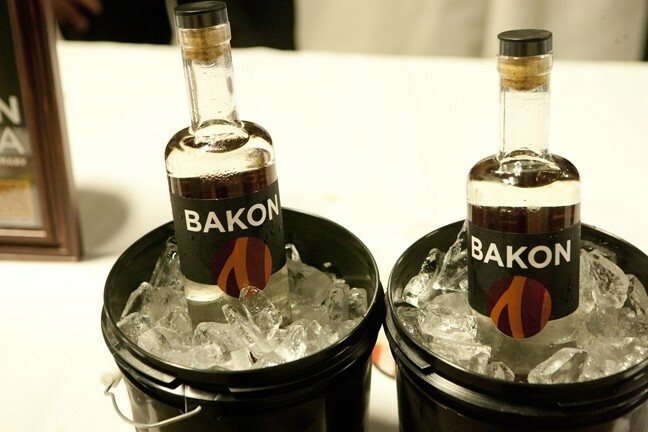 The Seattle-based company’s bacon-flavored vodka would go great in a Bloody Mary! The first thing I nosh is a brisket slider with bacon from G. Brothers Smokehouse. That’s some tasty business: tender, moist, and a hint of bacon—but then I see Phil Lang of Bon Temps Creole Café, where my wife and I go regularly for breakfast (Fat Tuesday Omelet for me, Eggs Sardou for her … best in town!). He’s serving up bacon-laced jambalaya that’s off the hook delicious. Mmm! Next I spot Sidecar’s table. This restaurant makes great food! Even their hamburger is incredible, but today they’re serving up their handmade tater tots with their homemade bacon-infused barbecue sauce. Man, I could just park myself right here and keep popping those deep-fried balls of heaven! BACON FLAVORED VODKA? : Yes, it’s real, and it’s made by Bakon Vodka from Seattle, Wash.
There’s a lot of good pizza in SLO Town, but Woodstock’s is perhaps the most venerated, and so when I see they’re serving up their BBQ Bird pizza with bacon, well, I’ve got to do it! Sorry, Doc! For the love of all that’s decent and holy! There’s the SLO Donut Company with their maple donuts with bacon crumbles! Oh hell yes! 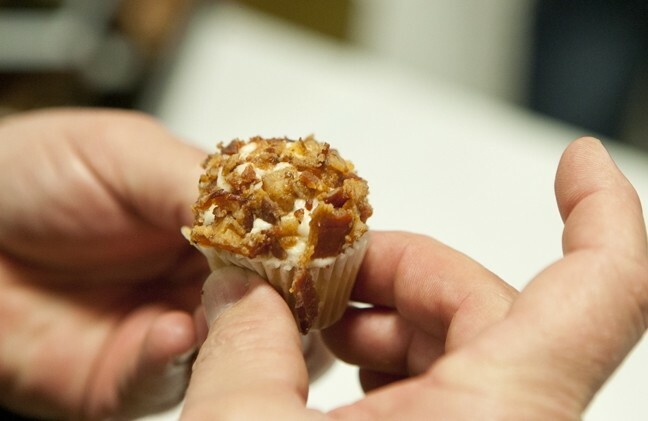 Anyone who’s ever had maple syrup on a slice of bacon knows it’s a salty sweet treat! I see Mother’s Tavern is serving up little shots of tomato, herbs, and roasted vegetable soup, with the rim of the cup dusted with bacon. Soup! 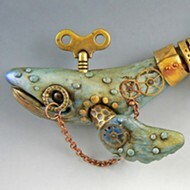 Seemingly so simple, but wow! This is the best! Whitney Knodle says she’s the kitchen manager, but I’m bestowing on her the title of executive chef for this masterpiece. “Knodle is German for dumpling,” she tells me before giving me the recipe for her soup. I’ll never tell! I’m finally getting parched, so I make my way to the Firestone Walker Brewing Company table and get a cup of their 805. I have a bunch of friends who love it but I’ve never tried it, and it’s a pretty tasty brew! A blond ale, it’s full bodied with a smooth finish. Refreshing! 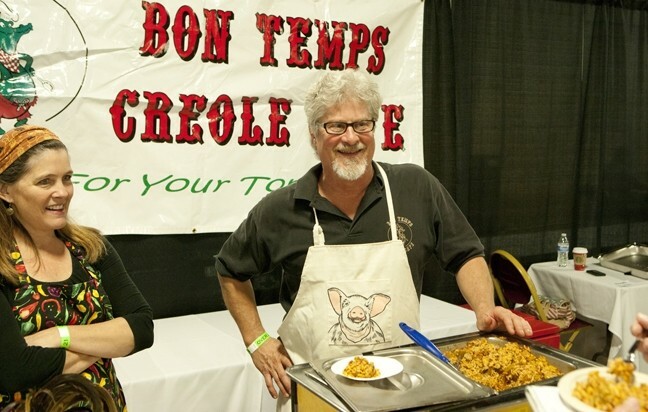 SOUTHERN STYLE: Bon Temps Creole Café owner Phil Lang (right) served up some of his amazing bacon-laced jambalaya! I know I shouldn’t after that doughnut, but I have to try one of Lickety Split’s bacon cupcakes, and why not, I also have Creekside’s bacon brownie sundae, because—you know—I’m working! Everything’s so good! Spike’s is serving buffalo balls—chicken, jalapeño, and cheese poppers—with bacon ranch dressing. Wowza! Tahoe Joe’s bacon wrapped shrimp? Delicious! Chino’s bacon wrapped jalapeño? Spicy! Pluto’s blanched brussel sprouts with honey, red onion, and bacon? Sophisticated! Hey, there’s Cal Poly’s Meat Science table serving up bacon made by Cal Poly students. “We raise the animals on campus, their feed is grown on campus, and we process them and make the bacon on campus,” explains Ag Business graduate student Steven McLenna. Learn by doing, Cal Poly! EATING BACON TO FEED CHILDREN! : Money raised through SLO Bacon Fest supports after-school meal programs in the county via Ward House Charities. “Nearly 15,000 SLO County elementary and high school students live in low-income homes. For many, school meals are their main source of nutrition. Some children may only eat 10 meals a week. We can help fill the food gap by proving another meal via the after-school meal program,” according to Ward House. 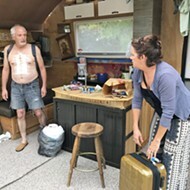 Learn more at wardhousecharities.org. It’s hard to believe I finally reach my bacon limit, but as I’m leaving, it’s a bird, it’s a plane, it’s Bacon Lady! It’s actually Stacy Martinelli, who says she’s entering the Bacon Queen Pageant, but she’s more superhero than queen. “I thought the ‘queen’ thing seemed kind of sexist, so I went with the superhero look,” she says, and I agree! Be empowered, super powered, bacon powered! Well, not me. I’ve had my bacon for the year—doctor’s orders.